Part Used : Mainly Bark, Roots And Whole Plant. Habitat : Throughout india, in dry waste places. 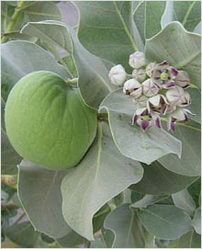 Uses : Calotropis procera plays an important role in improving soil fertility and improved soil water holding capacity. The root bark is febrifuge, anthelmintic, depurative, expectorant, and laxative. The powdered root promotes gastric secretions and useful in asthma, bronchitis, and dyspepsia. Dried whole plant is good tonic, expectorant, depurative and anthelminthic. Madar root-bark is very largely used in India as a treatment for elephantiasis, leprosy, and in chronic eczema. It also used as antidote substance and for abortive purposes. Leaves are useful in the treatment of paralysis, arthralgia, swellings and intermittent fevers. Flowers are useful in asthma, catarrh, anorexia, inflammations and tumours.